Building a rocker table can be as simple as stacking blocks of wood to the required heights and then adding wedges to support the hollows. 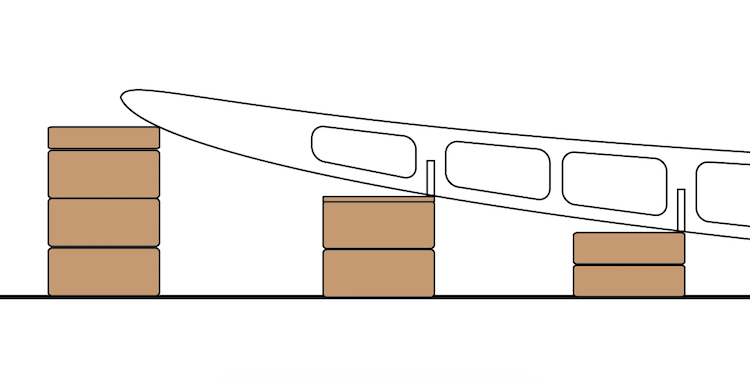 The simplest way of determining the heights is by measuring the completed spar before the ribs are attached. Lay the spar on its side next to a straight edge and write down the desired heights for your blocks. All the blocks are set with the lower side under the notch. (Pictured in the first image) The rear section of the same board will have the blocks on the opposite side of the notch. With all the blocks set to the correct heights, it is recommended you fasten them securely as it is a pain if they move as you are building. The drawback to this style of rocker table is that the blocks do not match the profile of the rib contours. It is recommended you insert wedges to pad the hollows as you attach the fishbone to the bottom skin. I recommend taking a couple hours and building a ladder style rocker table, as they are easier to work with.